CPT 8000 - Keep business moving! The best things come in small packages! That’s why you can expect incredible productivity and great value for the 8000 series. 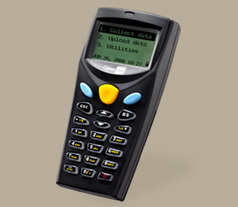 The CipherLab 8000 series mobile computers combine easy scanning, accurate data capture, long working hours and powerful options in a compact handheld. With efficient data capture and control, it ensures shelves stay fully stocked and keeps merchandise moving. Best suited for: Retail environment, right from grocery and convenience stores to specialty and department stores. Combine scanning and data entry in one compact lightweight handheld. 100 continuous hours on AAA-size alkaline or lithium-ion rechargeable batteries. Supports robust data manipulation and storage. Enables real-time data transmission with Bluetooth® option. From batch to wireless connectivity, it supports a range of solutions.